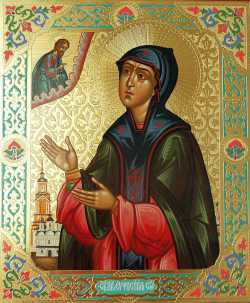 Saint Euphrosyne, Princess of Suzdal, was born in the year 1212. In holy baptism she was given the name Theodoulia and she was the eldest daughter of the Holy Martyr Michael, Prince of Chernigov (Sept. 20). Prince Michael and his wife Theophania did not have children and they often visited the Kiev Caves Monastery, where they prayed the Lord to grant them children. Princess Euphrosyne was their first daughter, sent from God in answer to their prayer. Three times the Most Holy Theotokos appeared to them and said that their prayer had been heard and that the Lord would grant them a daughter. Theodulia was raised in deep faith and piety. The educated noble Theodore (Sept. 20) had a large influence on her upbringing. The education and uncommon beauty of the princess attracted many. The princess was betrothed to Prince Theodore (June 5), a brother of Saint Alexander Nevsky, but he died on the very day of his wedding in 1233. 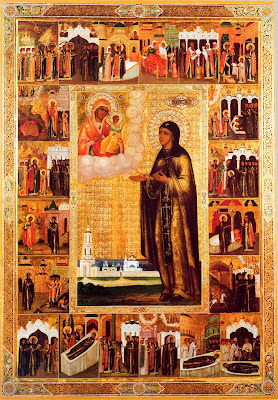 The princess withdrew to the Suzdal Monastery named in honor of the Placing of the Robe of the Mother of God, where she was tonsured with the name Euphrosyne, in honor of Saint Euphrosyne of Alexandria. While still a young nun she fulfilled the monastic rule of life with an amazing zeal, and she remarkably surpassed the other residents of the monastery in her firmness of reason, spiritual insight and extreme abstinence. The Lord Himself visited the ascetic, commanding her to be vigilant and positive in her efforts. Saint Euphrosyne, to the very end of her life, kept the commandments of the Savior, and overcame countless temptations. 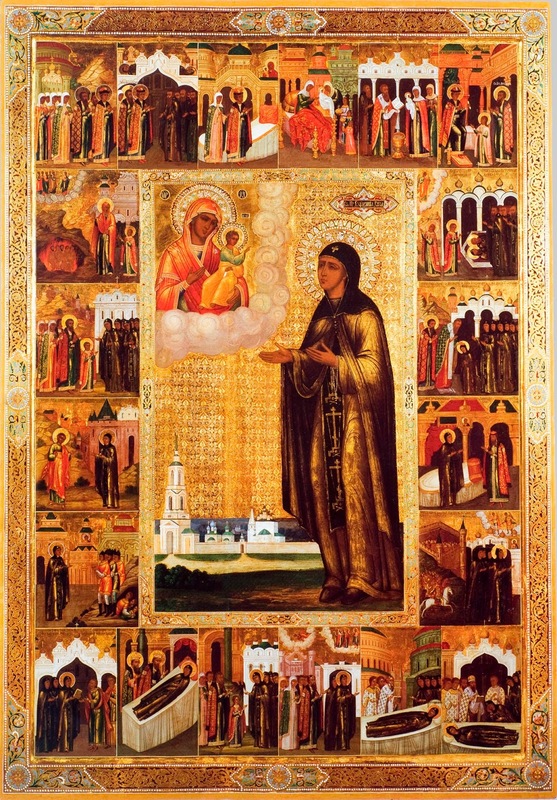 The extraordinary ascetic life of Saint Euphrosyne became known at Suzdal and beyond its borders. A multitude of people visited the monastery, in order to listen to the instructions of the nun Euphrosyne concerning love, prayer, obedience and humility. Often after such talks, many accepted the monastic schema and began a more zealous service to God. The abbess of the monastery herself had recourse to the counsels of the nun. At the request of the ascetic, the sisters of the monastery were divided into two halves: virgins and widows. This facilitated the spiritual growth and strengthening of the sisters of the monastery in purity. 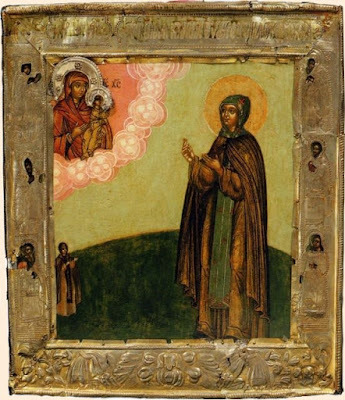 After the death of the abbess, Saint Euphrosyne became abbess of the monastery. The Lord foretold to the holy abbess her father’s martyrdom, and also the Mongol-Tatar invasion of Rus. In the year 1238, vast Tatar-Mongol hordes did actually descend upon the Russian realm. Destroying everything in their path, they came to Suzdal. The city was completely devastated and burned by them, and only the monastery of Saint Euphrosyne was spared through her prayers. After her father's death, she was dressed in rags and spent many days in fasting and prayer. When one of the residents of Suzdal was shocked to see her old clothes, Euphrosyne said: "The fish in the cold, covered with snow, do not spoil and do not stink, and even become delicious. So we, the monastics, if we endure the cold, become stronger and will be pleasing to Christ in life everlasting." 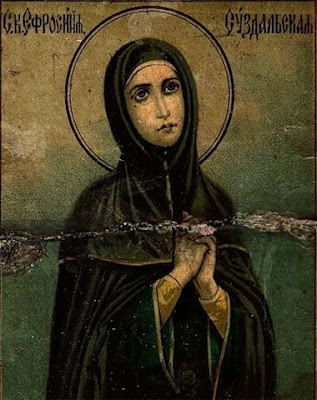 Saint Euphrosyne fell asleep in the Lord on September 25, 1250. At her grave believers were healed of various maladies. On September 18, 1698, with the blessing of Patriarch Adrian, Metropolitan Hilarion of Suzdal glorified the nun Euphrosyne as a saint. Then her relics were placed in the main church of the monastery. Under Soviet rule, they found themselves in the Suzdal Museum, and in 1988 they were transferred to the only Suzdal church, dedicated to the Equal-to-the-Apostles Constantine and Helen, from 1993 to 2010, which was under the jurisdiction of the schismatic Russian Orthodox Autonomous Church.